Fresh rosemary and olive oil are staples in this savoury—and colourful—vegetable dish. Preheat oven to 450ºF. 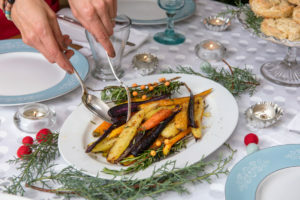 In a large bowl, toss the carrots in the olive oil, salt, pepper and rosemary until evenly coated. Place carrots in a single layer on a rimmed baking sheet lined with parchment paper. Roast 20–25 minutes, or until the carrots are tender and golden. Place on a serving tray and sprinkle with the finishing salt. Serve warm.